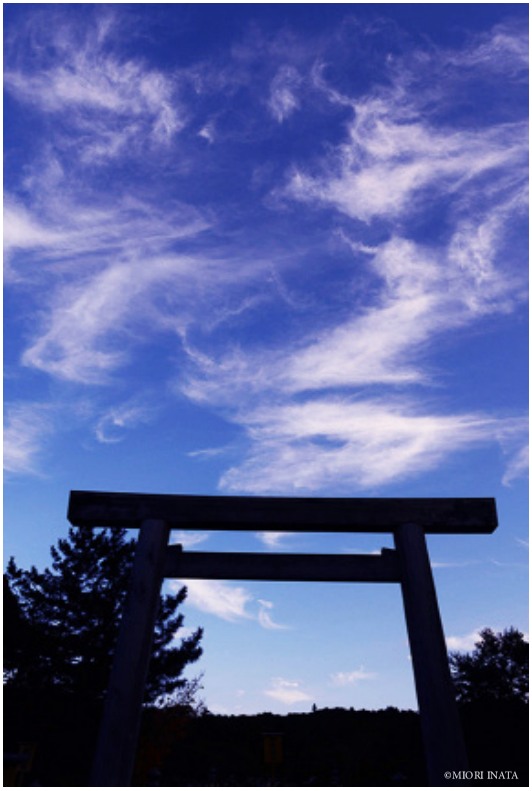 J-COLLABO and Tenri Cultural Institute present an exhibition by Miori Inata, who photographed sacred places around the world, including the Ise Grand Shrine, which is dedicated to Amaterasu, the goddess of the sun and the universe. A graduate of Tama Art University with a degree in oil painting, Inata lived in New York for 17 years and became a professional photographer after taking a photography course at Southampton University. She witnessed the terrorist attack on the World Trade Center on September 11, 2001. After watching the tragedy unfold from her apartment window, Inata began a quest to find the relationship between humans and deities, embarking on pilgrimages that took her to the world’s sacred religious places. She visited the Ise Grand Shrine in Mie Prefecture, Japan, and learned how simplicity is an invaluable quality in our everyday lives. She felt peace and serenity, and with the graceful spirituality of the shrine, she was able to feel tranquility in life. “What most impressed me at the Ise Grand Shrine was the belief that nature protects us, and that we are all a part of it,” says Inata. In addition to her stunning photographs that reveal the daily life and seasonal rituals of the people who work at Ise Grand Shrine, the exhibition also documents Inata’s travels to Palestine, Israel, Tibet, and Hawaii, among others. Inata will host an Artist Talk on Saturday, April 2 from 2:00 p.m. until 4:00 p.m. at Tenri.